Replacement or Improvement – Moyes’ First Mistake at United? As the English Premier League gets back to business this weekend, with a win and an international break the beleaguered David Moyes has some respite. Following Manchester United’s worst ever Premier League start there are already calls to get rid of him as manager and there have been numerous articles in the press since the close of the transfer window criticizing him for not securing a marquee name, his selection policy and numerous other ‘blunders’ that have been cited, contributing to a stuttering start for United. However, one mistake I believe he has made, which is a major contributor to United’s early season problems has received little airing in the press. 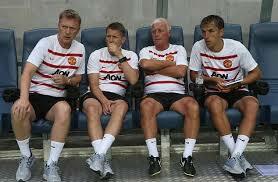 When Moyes took over, it is reported that he was counseled by Sir Alex Ferguson to retain his backroom staff. Yet before Moyes had officially started at United in July, Mike Phelan (Assistant Manager), Eric Steele (Goalkeeping coach) were all shown the door. While Steele had only been with United for five years, Meulensteen had been there for 12 years and Phelan for close to 14 on the coaching staff, as well as five years as a player. Clearly, they had been trusted by Ferguson had, particularly Phelan and Meulensteen had been part of the never say die culture and had many years of European as well as Premier league experience with United. They provided a continuity with the players that must have been disturbed, with a potentially unsettling effect when they left. So what of their replacements? Moyes has brought with him Chris Woods (goalkeeping coach), Steve Round (assistant manager) and Jimmy Lumsden (coach), together with ex United player Phil Neville, appointed to his first ever coaching role. He has also appointed Ryan Giggs as player coach, possibly in his attempt to retain some continuity. While Neville clearly has extensive experience of the environment of Old Trafford and their training set up, it is eight years since he left United for Everton. Of the others, only Woods has played in the top flight and none have worked on the coaching staff of any club bigger than Everton before United. While Everton is a Premier League club, they have won nothing under Moyes and the culture and environment is totally different. I get the feeling of a bunch of boys let loose in a sweet shop, not sure where to start. How often is it true in the business world that a new senior manager or CEO comes in, bringing those he has worked with before and disrupting the environment, demotivating existing staff? Manchester United was not in need of remediation, having won the Premier League at a canter last season. Year on year Sir Alex had brought in new players to freshen up the side and develop those there into better performers. It didn’t always work in the way he would have liked but a bulging trophy cabinet has demonstrated that it worked most of the time. However, even in the context of an environment needing serious remediation, replacement is rarely the answer in providing a sustainable solution.